For this final Fish Friday, I offer this recipe from the book, a good one for the recovering fish-frightened. The sauce is easy to make, and gives some wiggle room by keeping the fish moist and insulating it from the oven’t heat. Now, go fish! To learn more and find more recipes, take a look at the book. And the Moose is on the loose! Visit Events at debbiemoose.com. to find a cooking class or signing I’m doing near you. Place the tomatoes in a food processor and pulse to chop coarsely. Do not puree. Place 1/3 cup olive oil in a large frying pan over medium heat. Add the tomatoes, onions and garlic. Cook, stirring occasionally, until the tomatoes begin to give up their juice and the onions are soft. Add the oregano or marjoram, salt and pepper. Reduce the heat and simmer, stirring occasionally, for about 10 minutes or until the mixture thickens slightly. Remove from the heat and stir in the parsley and capers or olives. Taste and add salt if needed. Preheat the oven to 350 degrees. Coat the bottom of a baking dish with a little olive oil. Place the fish in the dish, skin side down, and spoon the sauce over the fish, making sure to cover it completely. Bake for about 20 minutes or until the fish flakes and is done. Serve with Italian bread for sopping up the sauce, if desired. Decades ago, my husband purchased a whole smoked whitefish for breakfast. It was the first time I’d seen an entire fish in such close proximity, and first thing in the morning, too. So I understand those with Fear of Fish, and even some experienced cooks, who shy away from cooking an entire fish. I had never cooked a whole fish until I was working on “Carolina Catch: Cooking North Carolina Fish and Shellfish from Mountains to Coast.” I knew I had to include something on cooking whole fish, and many people – from chefs to adventurous friends – had told me that it was easy and I’d love the results. Also, Thai and other Asian cuisines routinely cook whole fish in various ways, so it’s an important skill for exploring those styles of cooking. I did it, and all I have to say is: I shouldn’t have waited so long. Neither should you. It was indeed easy and produced some of the most moist, flavorful fish I’ve ever eaten. I shouldn’t have been surprised, because chefs always say that meat cooked with the bone – bone-in chicken, for example, rather than boneless chicken breast – has much more flavor. And that’s true. Why shouldn’t it be true for fish as well? Fish markets typically sell cleaned whole fish, which means anything inside that you don’t want has been conveniently removed for your cooking pleasure. Look for whole fish that appear moist, not dried out, and with firm flesh. When you get the fish home, you can follow instructions in “Carolina Catch” for simple roasted whole fish stuffed with herbs and ginger. All the equipment you need is a baking sheet and oven. There’s also a recipe for Thai-style whole fried fish that uses a wok. Whole sea bass, snapper and flounder are good choices. Carving the cooked fish for serving is easy. With a knife and spatula, the top filet will lift right off, then the bones can be pulled out of the lower half of the fish. I have detailed instructions in the “Best Basics” section of the book. So, go whole fish! To learn more and find more recipes, take a look at the book. And the Moose is on the loose! Visit Events at debbiemoose.com to find a signing or cooking class I’m doing near you. We’re in the thick of summer now. Fresh corn, peppers and beautiful North Carolina shrimp. I combine them all whenever I have a chance – and sometimes throw in some okra, too. Shrimp makes a great substitute for the smoked trout that I used in the original recipe in “Carolina Catch: Cooking North Carolina Fish and Shellfish from Mountains to Coast.” In fact, most of the recipes in the book offer alternative seafood suggestions so that you can use whatever’s available at different times of year. To learn more, and find more recipes, take a look at the book. And the Moose is on the loose! Visit Events at debbiemoose.com to find a signing or cooking class I’m doing near you. Place the corn, bell peppers, green onions, flour, chili powder, paprika, salt and shrimp in a large bowl. Toss to combine. Stir in the eggs. Put enough oil in a frying pan to come about 1 inch up the sides. Heat over medium until the oil shimmers. 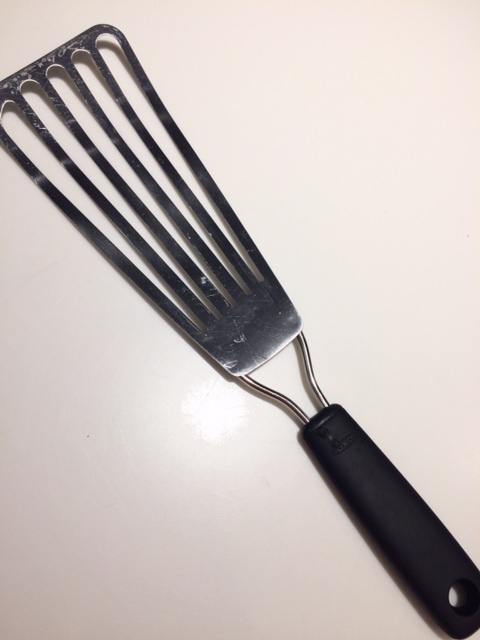 (See frying tips in “Best Basics” in “Carolina Catch”) Use 2 large spoons to scoop out the batter into patties and place them in the hot oil. Lightly press each patty to flatten it. Cook the patties, turning once, until they are brown on both sides. Drain them on paper towels or on a cooling rack placed over a plate. Keep the cooked patties warm in an oven on low heat until all the patties are cooked. It’s summertime and the smell of charcoal smoke again covers the land. (If you’re a gas griller, fine, but I am a charcoal girl to the core and the daughter of one, too.) Slide those burgers over and make room for fish – it’s easy to cook fish on the grill if you keep a few simple things in mind. You can grill any kind of fish (whole or filleted), but if you’re just starting out, you may have better success by using thicker or steak-ier kinds of North Carolina-caught fish fillets. Try swordfish, mahi, drum, cobia, amberjack or yellowfin. 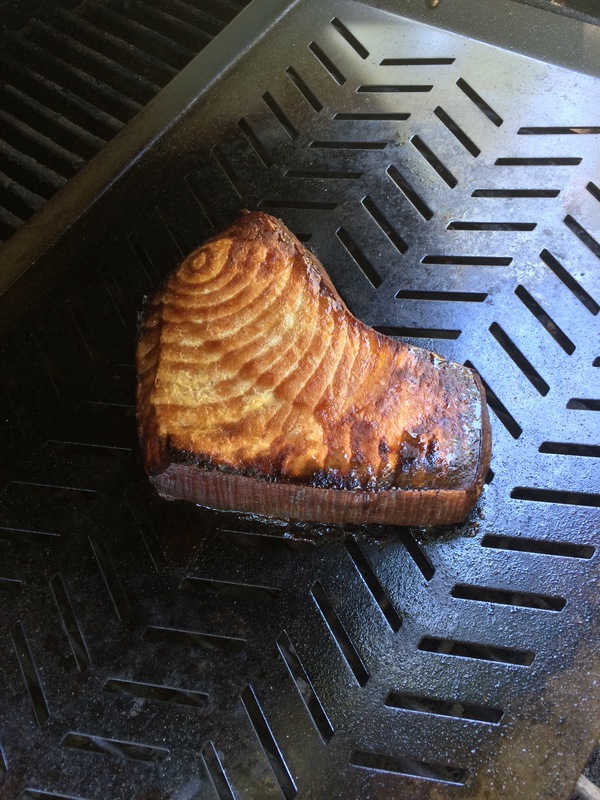 Place a slotted grill pan (the kind for grilling vegetables) on top of the grate to prevent losing the fish through the widely spaced grate. Get a nonstick pan, or spray it with nonstick spray before placing it on the grate to heat up. To ensure against drying out and add flavor, give the fish a quick soak in a simple marinade before cooking. Citrus juices and olive oil are a nice combination. Let the fish marinate about 15 minutes, but not much longer – acids will “cook” the meat and make it rubbery after grilling. Direct heat is fine, or if you’re uncertain, use indirect (it will take longer). Monitor the cooking, turning the fish only once, and use your trusty instant-read thermometer or a sharp knife to determine when the fish is done. By the way, smoking fish at home isn’t difficult, even if you don’t have a smoker. I have detailed instructions in “Carolina Catch.” To learn more, and find more recipes, take a look at the book. And the Moose is on the loose! Visit Events at debbiemoose.com to find a signing or cooking class I’m doing near you. 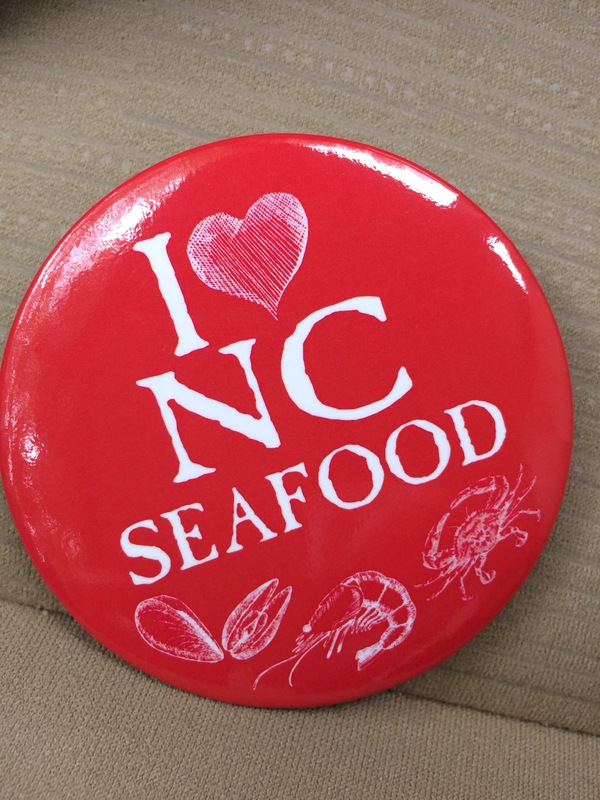 With summer comes wild-caught North Carolina shrimp season, and since shrimp is by far the most popular seafood, I know y’all have been looking forward to it. Many people don’t realize that fish and shellfish have seasons, just like fruits and vegetables do. Certain kinds are more prevalent at certain times of year, and I offer a guide to seafood seasonality in “Carolina Catch: Cooking North Carolina Fish and Shellfish from Mountains to Coast.” If you familiarize yourself with seasonality, you’ll get the best-tasting, freshest fish and shellfish, and maybe save a little money, because at the height of a season, prices may come down. Great local shrimp don’t need much fuss and bother, I say. On a hot day, cooked shrimp tossed on a newspaper-covered table to peel and eat is perfect. Here’s how I boil shrimp: pour a beer into a large pot (and open one for myself), add water to cover the shrimp, toss in three or four slices of lemon, maybe a garlic clove, and generous shakes of a seafood seasoning (such as Old Bay). When the combination comes to a boil, add the shrimp and cook just three or four minutes, until they turn bright pink and give off their shrimpy perfume. To learn more – and get more recipes – take a look at the book. And the Moose is on the loose! Visit Events at debbiemoose.com to find a signing or cooking class I’m doing near you! No heating up the kitchen to make this spread from “Carolina Catch,” which is great for summer parties. Put the cream cheese, mayonnaise and smoked trout in the bowl of a food processor. Process until combined. Add the red onions, pepper and capers, and pulse a few times until they are just mixed in. Scrape the mixture into a container and sprinkle with the parsley. Cover and refrigerate for at least 8 hours or overnight. The spread can be made up to 2 days ahead. Serve with crackers. Flounder, snapper grouper – these are the perky cheerleaders of the fish world. Everybody loves them But give some love to less familiar fish, such as the grunt. Maybe we should start by getting this fish a new name, because that’s a terrible one to hang on a delicious flaky, white fish. But as I learned working on “Carolina Catch: Cooking North Carolina Fish and Shellfish from Mountains to Coast” (UNC Press), there are a lot of good fish in the sea (and the ponds). Less familiar kinds of North Carolina fish are just as good to cook and eat as what I call the Big Three (see above) and seeking them out lessens overfishing pressures on popular fish. Also, you’ll find new and delightful things to eat. In “Carolina Catch,” I offer information on substituting different kinds of fish in recipes, and how to find fish you might like based on what you currently enjoy. For example, if you want to substitute something for flounder, look for another thin and flaky fish (not a thick and steak-like one, such as mahi). An important piece of advice: Find a fishmonger who knows North Carolina fish and shellfish to guide you in selections. Here are a few of my don’t-miss fish. Try them! – Tilefish cooks up with a beautiful white color and tender, flaky texture. Its delicate, sweet flavor requires little more than a squeeze of lemon and a bit of butter. You’ll never look at flounder again. – Sheepshead offers texture and flavor that stand up to being simmered or baked in sauces. To learn even more – and get recipes from appetizers to sides – take at a look at the book. And visit the Events list at debbiemoose.com to find a signing or cooking class I’m doing near you.